Oh what fun it is to wear these fabulous Christmas tree earrings with present dangles! And the style is perfect to wear all month long to usher in the holidays with sparkle and glee. The key component to make these earrings is a triangular metal frame with three loops that is available from Fire Mountain Gems. If you don't want to order the frames, or the holiday snuck up on you, you can easily make a simple triangle from wire with a wrapped loop at the top. The three loops on the frame aren't really needed since you can attach the drops directly to the frame with jump rings. Sometimes the best part of making jewelry is using the materials you have on hand to make a project truly your own! To make the crystal holiday tree earrings, you will need basic wire working tools of round nose pliers, flat nose pliers, and flush cutters. 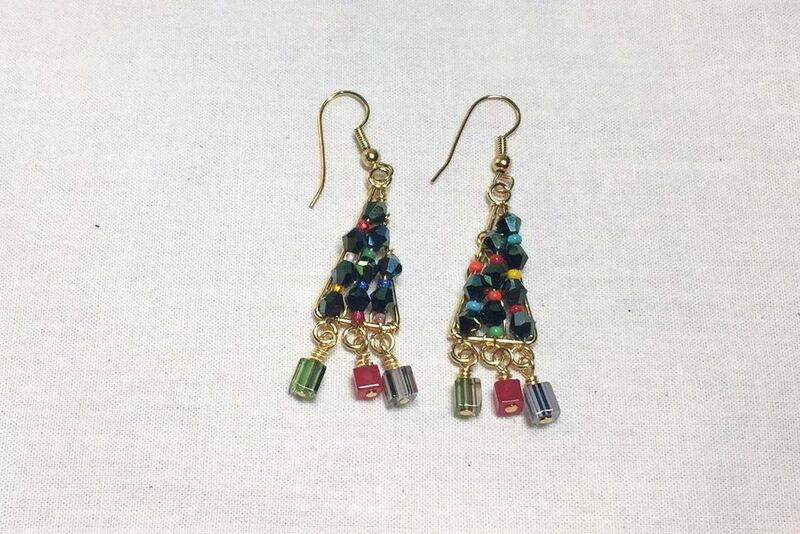 The materials you need are a triangular wire frame, about 10 inches of 24 or 26 gauge wire to wrap the beads to the frame, bicone crystal beads, bright colored seed beads and square or rectangular beads for dangles. The sample earrings use 4mm bicone crystals. Small crystals make it easier to get the beads to fit into the wire frame and maintain a tree shape. If you are relatively new to wire wrapping, you may find it easier to use 26 gauge wire to wrap the beads.The thicker wire can get kinked when you are pulling it through the small spaces and wrapping it around the frame. Leaving a small tail of wire to hold on to, wrap the wire around the frame two or three times until it is secure. The long end of the wire should be coming over the frame towards the center of the triangle. Pick up enough beads to fit within the frame from top to bottom. You can alternate crystals with seed beads or do whatever pattern suits your tree. Align the crystals on one edge of the wire frame, without going over it too much. Fix the crystals in place by wrapping the wire to the bottom of the frame. You can go through the top of the ring and then wrap around the space between rings. If you made your own frame, you can just wrap around the bottom of the frame. Bring the wire up the back of the frame and wrap it around the top of the frame once or twice. Make sure the wire is going over the front of the frame so the crystals will line up. Pick up the beads for the next row. In this case, there are four crystal beads in the first row, three crystal beads in the second row and two crystal beads in the third row. Seed beads are between each crystal to add some ornament like color and also help space the beads. Wrap the wire around the frame at the bottom and bring the wire up around the frame on the back side. Wrap the wire around the top of the frame one or two times and then pick up the beads for the next row. Do your best to hold the wrap in place and not let it slide down the frame when you pull on the wire. Also, pinch your fingers together and run them down the wire after each wrap to keep the wire kink-free and smooth. It will make it easier for your to keep the wraps tight and not have gaps of wire showing between the beads. Wrap the wire to frame at the bottom of the bead row and pull the wire up around the back of the frame. Wrap the wire around the loop at the top to secure it and then trim the wire end with your flush cutters. Tuck the wire end against the frame using your pliers. I love the square cane glass beads that I found to use as presents under the tree! They have colorful stripes that run through the glass and look like different wrapping paper. You can use any cube or cylinder shaped beads for the dangles. The dangle beads are added with headpins. Slide the bead on the headpin and make a loop. Attach the loop to the bead frame loop and then secure it with a wire wrapped loop. Follow the same steps for the rest of the dangles. Add an earring wire to finish. Follow the instructions a second time to make another earring. Once you have finished making the wire and crystal Christmas tree earrings, you may want to try your hand at this other style of Christmas tree earrings or ornament earrings. They are fun and easy to make - and instructions and materials can be found at the link.